“The humanitarian crisis in Venezuela is a classic case of the need for blanket temporary protection,” said Human Rights Watch’s refugee rights director Bill Frelick. “This is not the time to be deporting Venezuelans,” he added. According to the United Nations, more than three million people have fled Venezuela in recent years, representing 10 percent of the population. The exodus is largely due to the severe shortages of medicine and food, leaving millions of Venezuelans in distressing and worsening living conditions. According to the Pharmaceutical Federation of Venezuela, the country is experiencing an 85 percent shortage of medicine. The ongoing economic crisis has also impacted access. In 2018, inflation in the South American nation was at a staggering 1,698,488 percent. The International Monetary Fund (IMF) estimates that the rate will reach 10,000,000 percent in 2019. As the official minimum wage in Venezuela is 6 dollars per month, many are unable to afford basic goods. “During Nicolas Maduro’s presidency, the government has failed to address the crisis while making heavy-handed efforts to deny and conceal its severity,” Human Rights Watch said. Among those efforts is Maduro’s government imposed aid blockade. The government even ordered to close its borders with Brazil, noting that Venezuelans are “not beggars” and do not need aid. As a result of the escalating situation, the number of asylum applications by Venezuelans has increased significantly. According to the U.N. 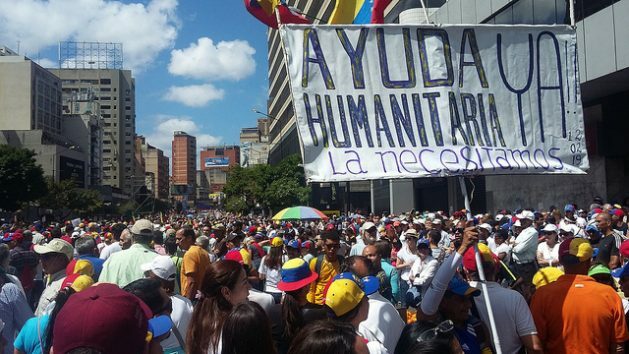 Refugee Agency (UNHCR), over 414,000 asylum claims were made by Venezuelans around the world, nearly 60 percent of them during 2018 alone. Between July and September 2018, Venezuelans were the leading nationality seeking asylum in the United States as they represented 30 of all asylum applications in the three month period. However, despite the crippling humanitarian situation, the United States continues to deport people back to South American nation. Immigration and Customs Enforcement reportedly deported 336 people to Venezuela in 2018, a 35 percent increase from the previous year. Meanwhile, the U.S. has not resettled a single Venezuelan refugee. Human Rights Watch urged the U.S. to provide Temporary Protected Status (TPS) to Venezuelans due to the deteriorating conditions in their home country. TPS allows foreign-born individuals to remain in the U.S. until conditions, caused by natural disasters or war, improve back home. Approximately 300,000 people have received those protections. Though the current administration has made several attempts to end TPS, a buck has blocked the most recent efforts and extended TPS for people from Sudan, Nicaragua, Haiti, and El Salvador. “Some Venezuelans will qualify for asylum based on a well-founded fear of being persecuted if returned,” Frelick said. “Temporary Protected Status is the best available way to offer protection for people who do not qualify as refugees or are not seeking asylum but who nevertheless should not be sent back to their country because of generally unsafe conditions there,” he added. A group of 24 senators including Chuck Schumer and Marco Rubio also asked President Donald Trump to designate Venezuela for TPS. “Venezuela clearly meets the standard for TPS as it is obviously too dangerous for Venezuelan nationals to return…granting TPS to Venezuela is a concrete measure your Administration can immediately take to alleviate the suffering of innocent Venezuelan civilians and to demonstrate our nation’s commitment to supporting a safe democratic transition in Venezuela so that individuals can safely return home soon,” they wrote in a letter. Human Rights Watch also urged Venezuela’s neighbours to grant region-wide temporary protection, providing Venezuelans legal status for a fixed period. Colombia is among those who have opened their doors, now hosting over 1 million Venezuelan refugees and migrants, the highest proportion in the region. The Colombian government has developed programmes to support fleeing migrants, such as a border mobility card which allows people to move between the two countries as well as a special work permit which provides Venezuelans temporary residence and work for two years. The response has been starkly different in Brazil where tensions have escalated, leading to riots against refugee camps. In one case, riots forced over 1,000 Venezuelans to flee back over the border. Though the country is continuing to accept arrivals at the border, it is uncertain for how much longer. UNHCR stressed the urgency of international support, appealing for 738 million dollars to support 2.2 million Venezuelans and 500,000 people in host communities across 16 countries.